I’m not going to be able to help you with separating your feuding guests, but I can help you with the aesthetic part of your seating chart and table numbering. For our wedding, I wanted to do something a little different when it was time to address the guest seating chart. Since our wedding was in a barn with one side completely open to the outside, we couldn’t use the traditional tent cards for each guest set up on a table for them to grab and take to their seat. The wind would have definitely blown them all away. I decided to use an oversized vintage style mirror instead. 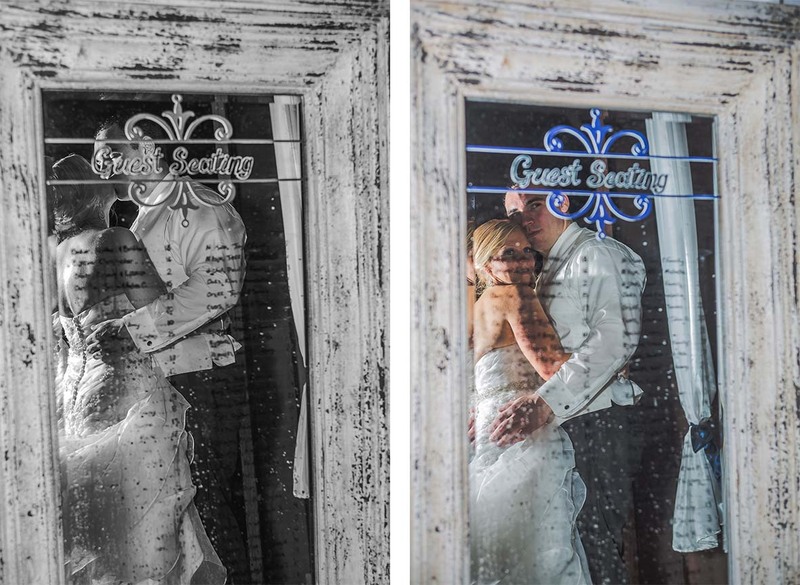 This mirror belongs to my Mom, so we borrowed it, making it a quick, easy and cheap DIY wedding project! I planned for two columns and used 1″ wide blue painter’s tape to define the space for each column. Then I measured the width of each row and used the super thin artist tape to make the guidelines for each guest name. Sharpies worked great for this project because it only rubs off with windex or similar glass cleaners. Dry erase markers would not be good for a seating chart. All it would take is one person to accidentally rub up against it, and then your wedding seating for the night is complete chaos. Guests were listed in alphabetical order by their last name and I grouped people based on: a single guest, couple, or family. I had around 140 guests, so I wasn’t about to write out every single name! Then the table number was listed next to each name. For the scrolly decorative graphic above and below “Guest Seating”, I actually designed and printed that on my home computer and printer. I cut it out and used spray adhesive to stick it to the mirror. I could have used a blue sharpie, but I didn’t have one in the right color so I improvised. I used wire cutters to trim the wire lengths and then spiraled the top end around the looping pliers to create the space to slip in the table numbers. Lastly, I painted the kraft paper colored chipboard numbers to match my navy table runners and napkins. My wedding centerpieces were planters filled with soil and moss (read about it here! ), so the wires just poked in and stayed in place. These would also work well in a vase of flowers. 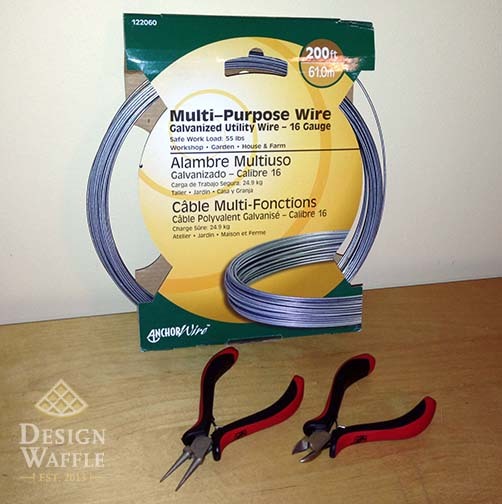 I spent about $10 on the wire and $12 on the numbers. 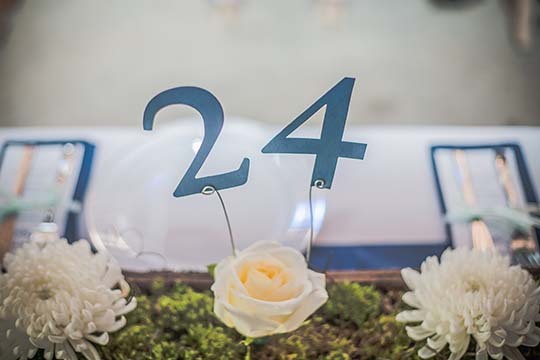 I hope my seating chart and table numbers gave you some inspiration for your big day! 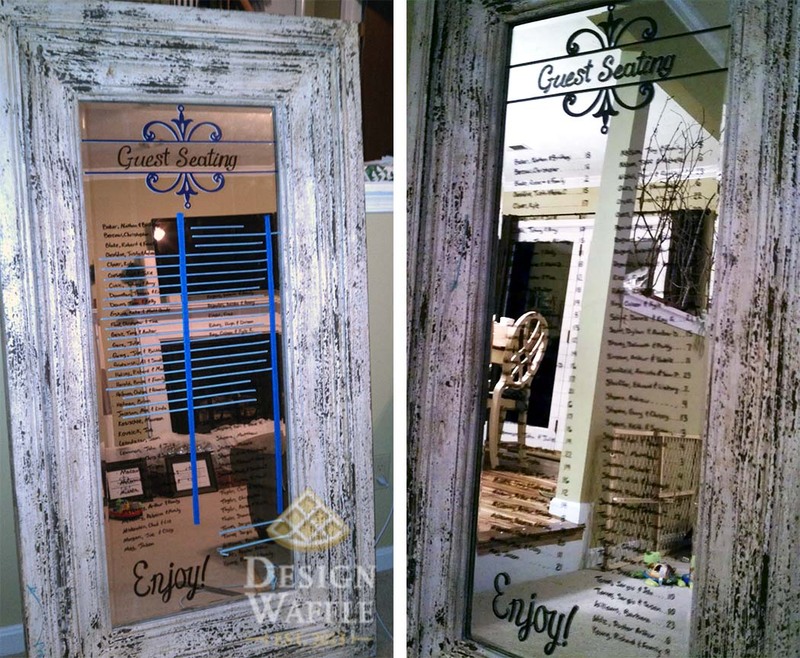 This entry was posted in Wedding and tagged Design Waffle, mirror wedding seating chart, Wedding Centerpieces, wedding table numbers DIY. Bookmark the permalink.